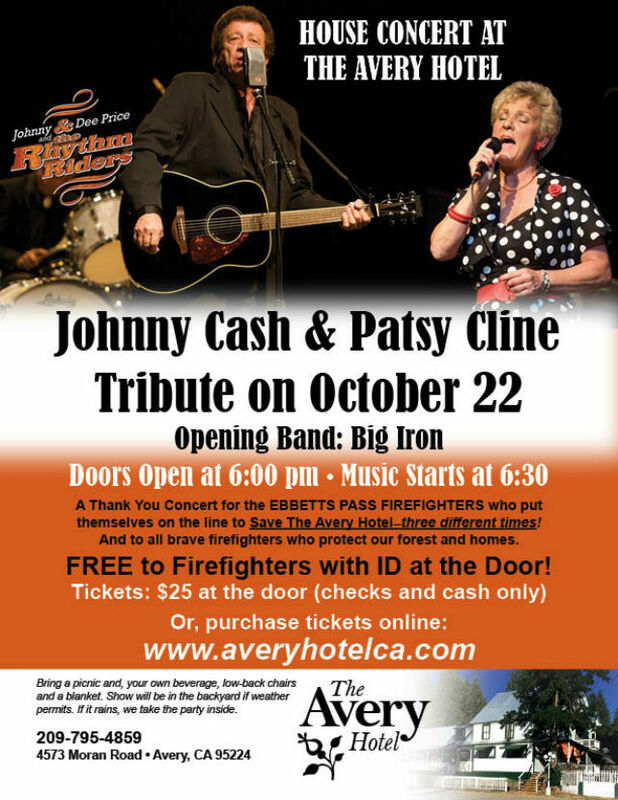 Avery, CA...On October 22, at 6:00 pm spirits are sure to be in residence at the Historic Avery Hotel while Johnny and Dee Price channel the energy of the iconic Country Western legends, Johnny Cash and Patsy Cline. This will be a first-rate performance not to be missed. The opening act is “Big Iron”, setting the pace for the tribute performance. Purchase tickets here at $25 or at the door (cash and checks only). Yummy finger foods will be served, and it’s ok to bring your own picnic and beverage. Bring a blanket and low-back chairs. Weather permitting, the performance will be in the backyard area under the stars. If it rains, we take the party inside. The Baker Family wishes to honor the Ebbetts Pass Fire Department for saving The Avery Hotel three times over the years. They wish to honor all firefighters for protecting this beautiful forest home and for their heroic service during the devastating Butte Fire of 2015. Admission is FREE to firefighters with ID at the door. Come see the newly renovated digs of the Baker Family. They’ve done wonders to revitalize The Avery Hotel (private events only) while retaining its historic integrity. The project is an ongoing labor of love. Known in the mid to late 1800s as Half-Way House, it was a stopping point for those heading east on Highway 4 from Murphys to Calaveras Big Trees. This one-acre estate with a lovely garden area and woodsy stage, provides the perfect setting for your next party or special event. Come help us raise the energy of this Calaveras treasure. Music is the universal language, and it is particularly sweet at the Avery. Together we make it a positive, feel-good community place. Come join the party. Call 209-795-4859 for more information. Event occurs on 10/18/2016 from 06:00 PM to .